2. 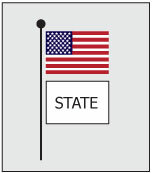 When flags of States, cities, or localities, or pennants of societies are flown on the same halyard with the flag of the United States, the latter should always be at the peak with six inches between each flag. The flag, when flown at half-staff, should be first hoisted to the peak for an instant and then lowered to the half-staff position. The flag should be again raised to the peak before it is lowered for the day. On Memorial Day, the American flag should be displayed at half-staff until noon only, then raised to the top of the staff. By order of the President, the flag shall be flown at half-staff upon the death of principal figures of the United States Government and the Governor of the State, territory or possession, as a mark of respect to their memory. In the event of the death of other officials of foreign dignitaries, the flag is to be displayed at half-staff according to presidential instructions of orders, or in accordance with recognized customs practices not inconsistent with law. In the event of the death of a present or former official of the government of any State, territory or possession of the United States, the Governor of that State, territory or possession may proclaim that the National flag shall be flown at half-staff. The flag shall be flown at half-staff thirty days from the death of the President or a former President; ten days from the death of the Vice President, the Chief Justice or a retired Chief Justice of the United States, or the Speaker of the House of Representatives; from the day of death until internment of an Associate Justice of the Supreme Court, a Secretary of an executive or military department, a former Vice President, or the Governor of a State, territory, or possession; and on the day of death and the following day for a Member of Congress. The flag shall be flown at half-staff on Peace Officers Memorial Day, unless that day is also Armed Forces Day. Flags flown on poles affixed to a home or building are not to be flown at half staff but a memorial streamer may be affixed to the top of the flagpole. "No part of the flag should ever be used as a costume or athletic uniform. However, a flag patch may be affixed to the uniform of military personnel, firemen, policemen, and members of patriotic organizations. The flag represents a living country and is itself considered a living thing. 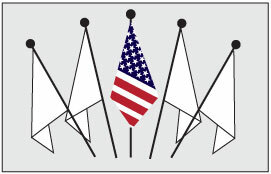 Therefore, the lapel flag pin being a replica, should be worn on the left lapel near the heart." 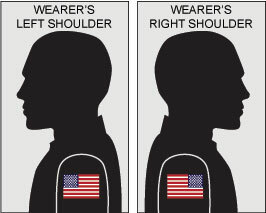 The National Flag Foundation suggests "...we recommend that the flag patch on the left sleeve of a uniform should have the union to the viewer's left while a patch on the right sleeve should be displayed with the union to the viewer's right so that, in both cases, the flag is facing forward and is streaming to the back as the person moves forward." Read more about the National Flag Foundation by visiting their Web site at www.AmericanFlags.org. 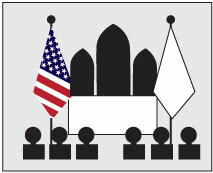 The orientation of the flag on vehicle decals should be treated the same as arm patches. 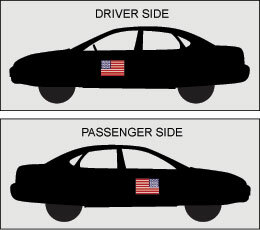 The National Flag Foundation suggests "The decals or paintings on a vehicle would also be placed so that the union on the driver's side of the vehicle would be to the viewer's left while the union on the passenger side of the vehicle would be to the viewer's right." Read more about the National Flag Foundation by visiting their Web site at www.AmericanFlags.org. When the US flag is flown alone, it needs be at the center on the back of the motorcycle, or to its "marching right." The "marching right" is on the right side of the motorcycle to the rider's perspective when facing forward. If the US Flag is on your bike with another, it should be to its "marching right." 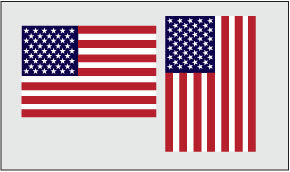 All flags flown with the US Flag are the same size and at the same height of the US Flag. While the US Flag is on your bike with several other flags the US flag is placed at the center and highest. 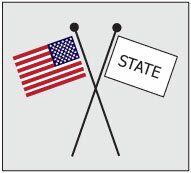 Other flags should be arranged in alphabetical order and in decreasing importance - Nations first, states (in order of admittance) and territories second, military third (in order of establishment), and then any others.
" 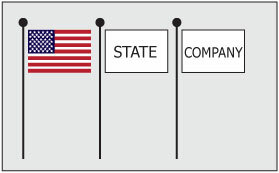 U.S. Ensign (flag) is flown at the truck (#1).
" 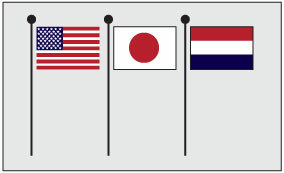 All other flags are pennants flown below U.S. Ensign.
" Club burgee (flag) is flown at the starboard (right) yard arm (#3).
" 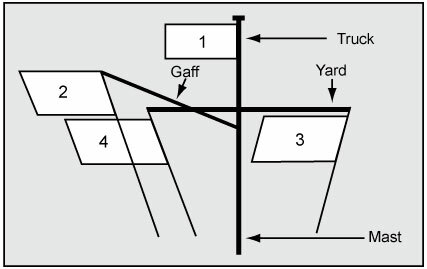 U.S. Ensign (flag) is flown at the gaff (#2).
" Club burgee (flag) is flown at the truck (#1).
" Flags at #3 and #4 vary depending on the activity at the club.